Experience Anna Maria Island on the back of your very own scooter from Segs by the Sea. We offer 2, 4 and 8 hourly, daily and weekly rentals. 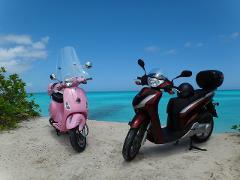 Experience Anna Maria Island on the back of your very own scooter from the Segs by the Sea. We offer 2, 4 hr and 8 hourly, daily and weekly rentals.